Nutri-Link and Doctors Data are professional health care companies providing services and product to meet the needs of clinicians, practitioners and their patients. Dedicated to the role of nutrition and functional medicine in the restoration of health disturbances they appreciate and recognise the role the gastrointestinal tract plays in the determination of health, metabolism and wellbeing. The last few years have seen a significant growth in the interest of the mucosal immune system and its relationship to the commensal bacteria, viruses and other organisms. In part, driven largely by the human microbiome project, and also because the incidence of functional gastrointestinal problems is increasing in the population; with often indifferent results from conventional pharmaceutical focussed strategies. For many years the concept of the GI tract as a primary organ of health was dismissed by conventional researchers and clinicians as being folklorist. Proposals such as dysbiosis and leaky gut were dismissed as fanciful or inaccurate explanations. The manipulation of the microbiome and in turn communicating meaningful immune messages to the myriad receptors present in the GI tract was seen as the primary role of drugs, not food, food concentrates or probiotics. Today, whilst by no means mainstream, practitioners find their long held beliefs being reinforced and expanded through prestigious journals such as Science and Nature. Clinicians find their primary care journals are taking seriously the role of symbiosis and that food accordingly may actually be one of the most significant first and on-going treatment strategies. Behaviourally induced and maintained, chronic diseases are increasingly understood to be related not simply to quantity of food but also quality of food and food combinations. This one day event is designed to explore some of the evolving events in microbiology, mucosal immunity and functional medicine. The presenters are well known for their many years of work in research, analysis, practice and lecturing. They will present substantive evidence of these evolving trends and how they impact on clinical decisions, describing where evidence is preliminary, novel, or of greater substantiation. The day will have a strong clinical bias and provide a welcome opportunity for questions and answers. Make you feel positive about the opportunities for helping more people recover their health safely. Gastrointestinal issues are one of the most common reasons that patients seek medical care and it is estimated that about 40% of people in the EU self-medicate with over the counter products instead of objectively identifying the root cause(s) of their problems. Further, gastrointestinal problems may be associated with chronic extra-intestinal problems that may not be further resolved without appropriate intervention of the more obvious intestinal issue. This one-day workshop will provide physicians a thorough review of stool testing and its role in targeting treatments for GI disorders. Leaders in the field of laboratory assessment will review the complexity of valid microbiological methodology, when it is appropriate to order a stool test and how to proceed with treatment based upon the entirety of the comprehensive training. Faculty will provide treatment options to address bacterial imbalances, pathogenic bacteria, yeast, parasites, digestive inadequacies and inflammation. This workshop will provide practitioners with an opportunity to apply or strengthen their clinical practice in the treatment of GI disorders. Michael Ash – Where are we now, and where are we going. Michael Ash – Evolving Relationships: Dysbiosis in Infectious and Non Infectious Chronic Disease, and the impact of loss of symbiosis on energy generating systems via induction of the inflammasome. David Quig – State of the Science: Current and Future Methodologies in Clinical Microbiology & why you need to know this for clinical life. 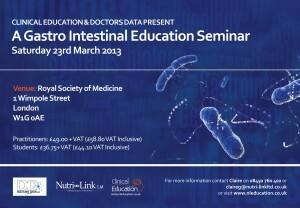 Antony Haynes – Compelling Cases, a review of clinical outcomes from a gastro-centric perspective, real life experiences explored and explained. 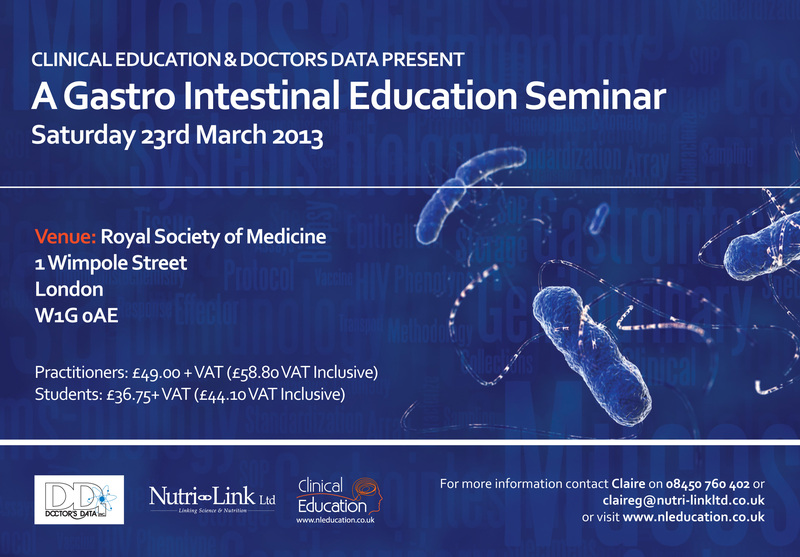 Recognise the signs and symptoms associated with GI disorders. Summarise the effects of pathogenic and beneficial bacteria. Incorporate supporting treatments to reduce or eliminate pathogenic bacteria, yeast and parasites.